Personalized Translucent Flashlights, Custom Printed in Bulk or Blank. Promotional, Inexpensive. Lowest prices in the USA and Canada. Free Artwork Design. Bulk personalized translucent flashlights at giveaway prices! We also supply blank (not custom imprinted) translucent flashlights at EQP (End Quantity Price). Lowest prices in the USA and Canada for personalized flashlights in bulk. American clients pay no taxes. 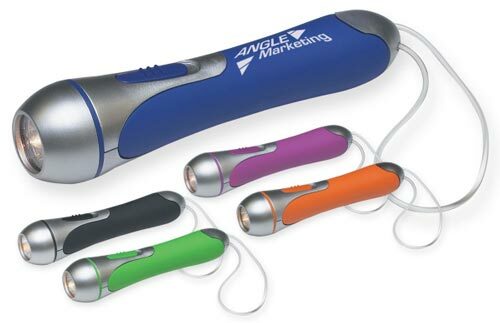 Unit prices below include your 1-color custom imprint or they are for blank (not custom imprinted) flashlights . Add $0.25 per flashlight for each additional imprint color. Setup Charge: $45.00 per imprint color (no setup for blank flashlights). Imprinting: Price includes a one-color, one-position imprint. Additional Colors/Positions: Add $0.25 each. Production Time: 7 Days after art approval; Blank flashlights ship next day. *Includes two AA batteries (not inserted). *Batteries may be boxed separately. Packaging/Shipping Weight: Individually Gift boxed, 200 pcs per carton of 29 lbs. RUSH 1-3 DAYS PRODUCTION IS AVAILABLE: contact us.